I love cooking on that cusp of summer to autumn, and in culinary terms it’s definitely one of my favourite times of year. 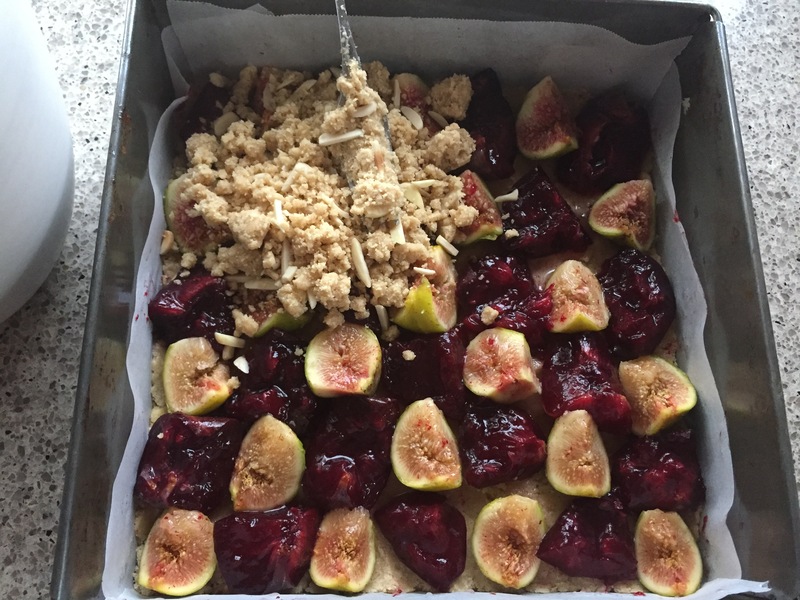 I regularly get gifted fruit from generous friends, and being given these lovely figs and plums was what led me to think of combining them in a slice once we’d eaten our fill of them fresh. 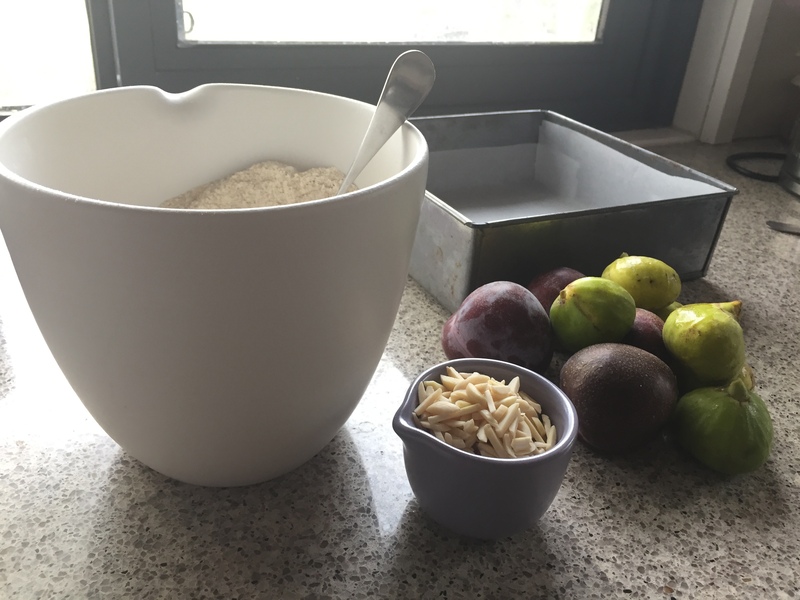 It’s not an obvious combination in some ways, but I find the incredible sweetness of figs when cooked is tempered beautifully by the tart plums, and the juiciness of the plums, collapsing almost to jam by the end of their baking, contrasts with the firmer figs – they’re really the perfect marriage! Preheat oven to 180C. Stir together the flour, almond meal and sugar. Add a pinch of salt if using unsalted butter. Rub in the butter with your fingertips until you get rough crumbs. 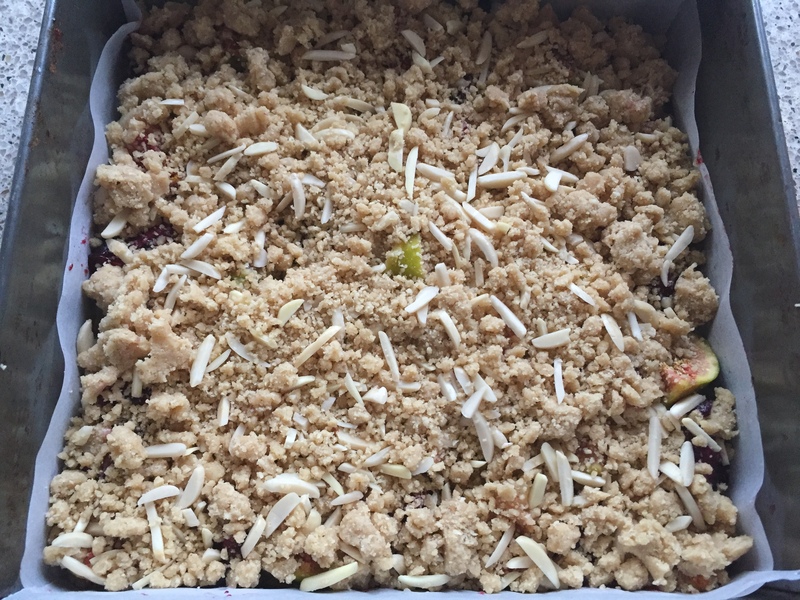 Line a 22cm (9”) square tin with baking paper and tip in 2/3 of the crumbs, pressing gently into a mostly even layer. Remove stones and stalks and quarter plums and figs, arranging over the base. 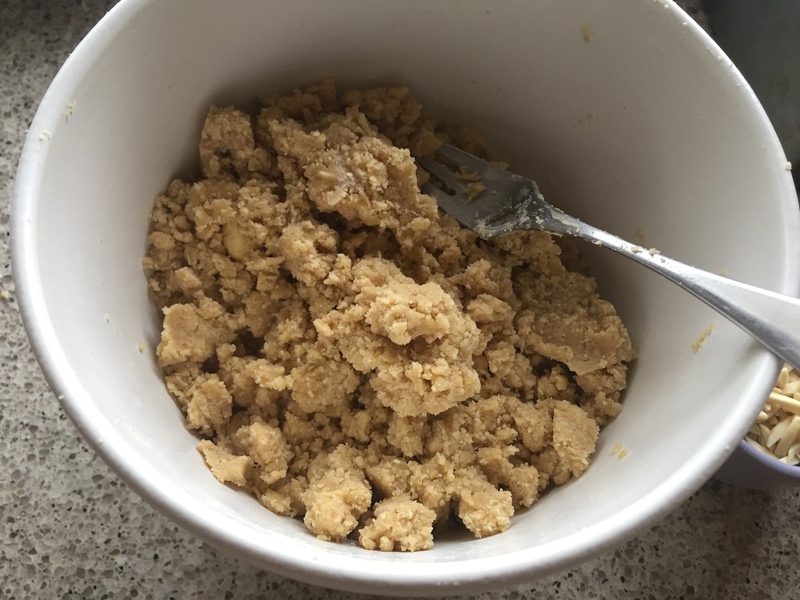 Crumble over the remaining pastry with the slivered almonds. Bake for about 45 minutes until golden brown. Cool in the tin on a rack until lukewarm at least before slicing. Makes 16 squares, and will last a few days in a airtight container at room temperature, though the topping will soften a bit. Thanks Beck for posting this one. It looks so delicious- now to ferret around and see if I have any plums stashed away. That tarty sweet combination is so good Beck. I love the generosity of people at this time of year too. A friend at work today came in with Portuagese tarts. They were amazing. They were which made them even more special. This pastry reminds me a bit of our family favourite – Apple and banana shortcake, courtesy of the Australian Women’s weekly, I think. What glorious colours and juicy syrups that plum and fig filling must have delivered, as they soaked into the pastry. Yum! Lovely post. I love the idea of using fresh ingredients. It’s so easy and straightforward to. I shall be making this soon!